Context: Limb lengthening demands constant monitoring of the regenerate bone by frequent radiological examinations. Aims: The aim of the study was to explore if sonography can be used in place of radiography for monitoring distraction osteogenesis. Settings and Design: This study was a prospective and observational study. Subjects and Methods: Thirty-five consecutive patients with a mean age of 24, where tibia was monofocally lengthened by mean of 5.5 cm ± 0.5 cm were included in the study. Along with all radiological assessments (every 2 weeks during Distraction Phase [DP] and 4 weeks during Maturation Phase [MP]), concurrent sonographic assessment was done and findings compared. Statistical Analysis Used: Descriptive methods. Results: Reparative granulation tissue in the distraction gap and endosteal reaction at both ends were visualized sonographically at 2 weeks before any radiological evidence of regeneration. The echolucent gap increased as distraction progressed with the internal hyperechoic signals getting organized to linear structures at 4 weeks when first radiological evidence was noted. This echopositive portion of the regenerate bone narrowed down by 6−8 weeks when radiographs showed bony trabeculae, more so in MP. By 14−16 weeks of MP, there was a significant reduction of echopositive zone, where more of regenerate got converted to hyperechogenic cortical bone. Sonography was poor in measuring distraction gap and assessing mechanical axis alignment. Sonographic findings correlated well with the findings of accelerated and poor regeneration on radiographs during DP and aided modification of distraction. Conclusions: Sonography is a valuable tool in DP and first half of MP and many radiographic examinations during these phases may be replaced by sonography. Judicious and combined application of sonography and radiography must be explored for superior characterization and monitoring during limb lengthening, with lesser radiation exposure. Limb lengthening for any indication demands constant monitoring of the regeneration and consolidation and occurrence of complications. Radiography is the standard modality of monitoring, and orthogonal views are recommended every 2 weeks during distraction and every 4−6 weeks during maturation of the regenerate in limb lengthening.,, Previous authors of cosmetic limb lengthening have performed radiological examination between 14−40 days during distraction and 40−50 days during maturation of regenerate.,,, Sonography, dual-energy X-ray absorptiometry (DEXA), and quantitative computed tomography (CT) have been studied as alternative modalities; however, plain radiographs still continue to be the gold standard assessment tool. Sonography detects new bone formation weeks before its appearance in radiographs. Radiographical assessment has limitations in assessing the rate of formation and quality of the regenerate in the early phases, but this assessment is crucial to adjust the amount of distraction to ensure optimum results. Furthermore, in a cosmetic setting, early assessment of regeneration will give the surgeon an idea if the targeted gain in length can be attained or if it needs to be reduced to avoid challenges related to delayed regeneration. Available studies on sonography in distraction osteogenesis mostly have studied patient cohorts across a range of ages, bone pathologies, and limb segments;,, some studies are confined to children with various pathologies in different segments., These factors definitely have an impact on bone regeneration and can potentially influence the timing of imaging when it comes to comparison across patients. The objective of this study was to explore the role of sonography in monitoring distraction osteogenesis. Including only patients of cosmetic limb lengthening ensures a uniform cohort with regard to age (skeletally mature patients <50 years), bone being lengthened (tibia in all cases), amount of lengthening done, and absence of any specific bone pathology. A prospective study was undertaken during the time period January 2010 to December 2013. All patients operated for bilateral cosmetic lengthening of tibia were included in the study. The indications for surgery were (1) presence of a clear reason to undergo limb lengthening, (2) strong motivation, and (3) consented to undergo the procedure after complete awareness of the nature of surgery, possible complications, and the rehabilitation program. The contraindications to surgery were (1) the presence of psychologic disorders such as dysmorphophobia, (2) associated endocrine disorders such as hypothyroidism, (3) the presence of systemic illnesses related to growth and development such as renal insufficiency. The cases where limb lengthening was done for pathological conditions such as achondroplasia and multiple epiphyseal dysplasia were not included in the study. Only patients with monofocal tibial lengthening were included in the study; patients who had bifocal tibial lengthening or concurrent femoral lengthening were excluded from the study. All patients were evaluated and treated according to a standardized protocol for preoperative assessment, surgical technique and postoperative monitoring, and rehabilitation. Before selection for surgery, all patients underwent thorough physical and psychological assessment to rule out systemic illnesses, dystrophic syndromes, endocrinopathies, and psychological illnesses and counseling regarding treatment and rehabilitation plan. The complete clinicoradiological assessment was done. We used the standard three-ring construct and tensioned olive wires (no half pins) for tibial lengthening. We did the proximal corticotomy below the tibial tuberosity and fibular osteotomy at the junction of middle and distal thirds. After a latent period of 6 days, distraction commenced on the 7th postoperative day at an average of 1 mm/day over 4 fractions. In some patients, it needed to be adjusted as per clinico-radiological findings. We encouraged full range of motion and full weight-bearing crutch-assisted walking as much as possible from the 2nd postoperative day. After gaining the planned length, fixators were left for close to double the period of distraction to allow consolidation of the regenerate. The period of distraction is called distraction phase (DP) and the remaining period is called maturation phase (MP). The decision to remove the fixator was taken based on satisfactory stress test after removal of the connecting rods and satisfactory evidence of radiological union as evidenced by cortical continuity in orthogonal views. After removal of the fixator, patients were given cast extending from thigh to supramalleolar region for a period of 2−4 weeks depending on the findings of stress test before fixator removal. As per our protocol, all patients underwent a radiological assessment every 2 weeks during the DP and every 4 weeks during MP. In this patient cohort, additional sonographic evaluation was done at every radiological assessment after approval from the Institutional Ethics Committee. Radiological evaluation was performed with Clinomat Pixel-HF 650 Halkay (Italy). Standard anteroposterior and lateral views were used to assess regenerate with regard to morphology, alignment, and adjacent joints and measure the gap between the fragments. We also looked for specific radiographic findings in the DP that have an impact on changing the amount of distraction. During MP, assessment was for the progress of consolidation of regeneration, remodeling, and alignment which subsequently guided minor adjustments of fixator and its removal. Sonographic evaluation was performed with Voluson 730PRO device (Austria) using 7.5 MHz linear sector probe in real-time mode (polyposition grayscale scanning). Assessment was done at the site of distraction with images obtained in longitudinal and transverse planes for the amount and quality of regenerate, and it was attempted to measure the distraction gap at every stage. The computer-aided sonography was performed by a single radiologist (TIM) with extensive experience in musculoskeletal sonography in the presence of the treating orthopedic surgeon (KIN), and findings were interpreted together by both in the light of radiographs obtained on the same day. After digitalization of the images, specific software (Histogramma. Austria) was utilized for computer-aided analysis, measuring the echogenicity of the digital sonographic image. This software was utilized to quantify the echogenicity of the regenerate, with the values being graded in grayscale ranging from 0 to 220 units, from black to white, respectively. Values from 0 to 70 were considered hypoechogenic, 71−140 were considered normoechogenic, and 141−220 were considered hyperechogenic. We assessed the preoperative acoustic density of tibia in all cases. With patient in supine position, the probe was placed on the anterior tibial metaphysis at an angle of 90°. Tibia has a homogeneous hyperechogenic structure with high acoustic density of 205 ± 10 units. Subsequent postoperative scan was also done in the same position. The scar of percutaneous proximal tibial corticotomy was taken as the landmark. Ultrasound probe was placed through the length and breadth of the long axis of the segment coupled with Sonogel. We assessed the regenerate qualitatively and quantitatively. The qualitative features appreciated were a gap between proximal and distal edges of parent bone, homogeneity or heterogeneity of echogenic regenerate, presence of linear hyperechogenic structures that corresponded to newly formed bone trabeculae, presence of endosteal and periosteal response to regeneration, and presence of hypoechogenic areas. Quantitatively, the echogenicity of representative areas was measured with the help of software. Using the same program, we calculated the volume of the whole regenerate, hyperechogenic, and hypoechogenic areas and from this derived the relative percentage volumes of hyper- and hypoechogenic areas. There were 35 eligible patients of whom 17 were males and 18 were females. The mean age of the cohort was 24 (16−45) years, with a mean preoperative height of 159 (143 to186) cm. Tibia was lengthened by a mean of 5.5 ± 0.5 (2−8) cm using monofocal distraction osteosynthesis. Surgery on both sides was performed on the same day in all patients. Reparative granulation tissue corresponding to the length of distraction (12 mm−14 mm) could be visualized at 2 weeks following distraction, where radiographs were of limited value. Sonographic evidence of initial endosteal reaction could be observed at either end of the regenerate. Scanning in the longitudinal plane showed oval reparative tissue with vague contours and sparse medium echogenic foci. As distraction progressed, the echolucent gap increased corresponding to the distraction and the hyperechogenic signals within it also increased and became more organized into linear structures. By 4 weeks of distraction, scanning in longitudinal plane, endosteal reaction at both ends could be well visualized. Linear hyperechoic structures evidencing early cancellous bone formation were visualized in the reparative area. It was at this stage that radiographs showed scanty evidence of osteogenic activity. By 6−8 weeks of distraction (end of DP in most cases), plain radiographs showed evident laying down of bony trabeculae all along the gap. Proximal and distal portions of the regenerate bone were denser and more homogeneous that appeared similar to the adjacent bone. At this stage, echopositive portion of the regenerate zone (a portion of the regenerate available for ultrasound penetration) on the longitudinal plane sonography started to narrow in both depth and lateral image field, more so in the MP. Echopositive portion of regenerate decreased with increase in number and calcium density of longitudinally oriented hyperechogenic cortical new bone and bone trabeculae due to poor through transmission of ultrasound waves. Sonographic and radiological picture at the end of DP in a patient with normal regeneration is illustrated in [Figure 1]a and [Figure 1]b. Echopositive portion of the regenerate occupied only 9%−12% of its original volume at 2 weeks of MP. Further decrease in echopositive portion of the regenerate could be visualized at 8−10 weeks of MP. By 14−16 weeks of MP, there was significant narrowing or absence of the echopositive portion of the regenerate due to no through transmission and total reflection of ultrasound waves by cortical bone. At this point of time, cortical bone was well appreciated on the radiographs and regenerate bone closely resembled adjacent bone with occasional medullary canal and well-preserved alignment. [Figure 1]c and [Figure 1]d shows the imaging characteristics at this stage. By 16−18 weeks of MP, trabecular pattern is well-established and regenerate bone more or less resembles normal bone being ready for removal of external fixator. Deviations from the normal course of osteogenesis were observed in five out of 35 patients (14.3%); three of which were poor regeneration (8.6%) and two were accelerated regeneration (5.6%). All patients (with both normal and abnormal regeneration) had symmetrical findings and progress on both sides and hence all analyses are done with the number of patients as the denominator (rather than the number of segments). High rate of reparative osteogenesis was observed in two of our patients (16-year-old male and 18-year-old male). Sonography of these patients showed dense areas of echogenicity with fragments that form chains between proximal and distal edges of the corticotomy during the 14th day of distraction. Hyperechogenic signals occupied 60%−70% of the regenerate at the end of distraction. Chains of hyperechogenic fragments of 8 mm−15 mm appeared to form between the proximal and distal ends of parental bone at 4−8 weeks of MP. [Figure 2]a and [Figure 2]b demonstrates high reparative activity demonstrated by echogenic shadows with corresponding radiological picture at this stage. The central regenerate zone was not appreciable as opposed to cases with normal regeneration. Subsequently, there was accelerated narrowing of echopositive portion of the regenerate due to the faster consolidation of regenerate. In these cases, the MP lasted only for 8−10 weeks due to fast consolidation. The distinct sonographical findings compared to the patients with normal regeneration were in spite of the faster rate distraction (1.25 mm to 1.5 mm/day) done during DP to prevent the premature consolidation of the regenerate before achieving planned length. Poor regeneration is a common problem in limb lengthening in pathological states. It was observed only in three cases (26-year-old male, a 30-year-old male, and 37-year-old female) as the indication was cosmetic in patients with normal bones and good general and bone health. Linear echogenic structures to be matched to new bone trabeculae during distraction could not be visualized in these patients, as in the time, it was appreciated in others. This indicated the presence of immature connective tissue and delayed endosteal reaction. Single or multiple hypoechogenic cysts could be visualized in intermediary regenerate portion of several patients. These features tended to increase as distraction proceeded. 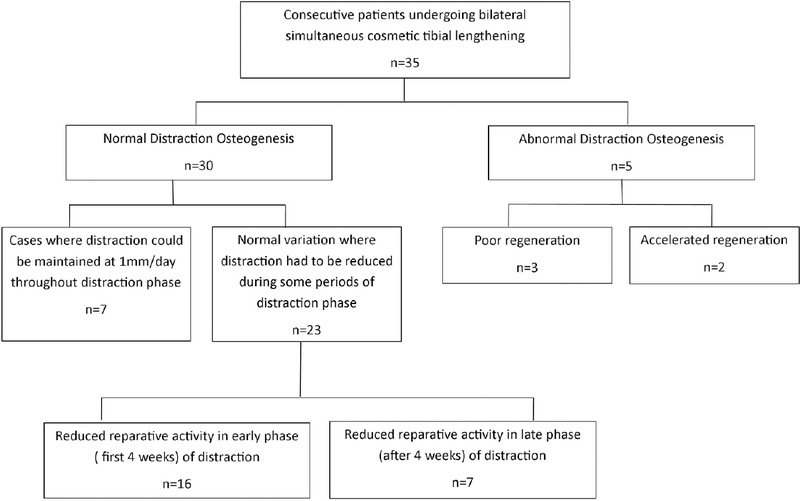 In such patients, the rate of distraction was reduced (by 0.25 mm/day with every sonographic examination with even cessation of distraction till improvement of sonographic findings) to ensure optimum osteogenesis, and the DP was correspondingly prolonged. Hyperechogenic signals were slow to appear in the DP. As MP commenced, the regenerate appeared to be echopositive for a prolonged period due to slower consolidation of the regenerate. The factors causing poor regeneration could be the older age of patient or suboptimal weight bearing and rehabilitation, resulting in poorer osteogenesis. [Figure 3]a and [Figure 3]b shows sonographic and radiographic picture at 56th day MP of a patient with poor regeneration. Sonography shows persistent echopositive region of regenerate and hypoechoic cyst with peripheral fibrosis, whereas radiograph reveals a nidus of delayed regeneration with a clear regular contour in the intermediary area extending to the proximal and distal fragments. The number of bone trabeculae is decreased with a thin cortical bone that can be hardly differentiated into zones. In spite of, normal sonographic findings during DP, a good number of our patients (23 out of 30) showed evidence of delayed reparative activity during some periods of DP. We considered them as normal variation in osteogenesis rather than pathological delay in osteogenesis. They were of two distinct categories. Sixteen patients presented with a reduced number of trabeculae during DP as early as 2 weeks; this could be settled by reducing the distraction to 0.75 mm/day or even 0.5 mm/day based on findings of follow-up sonography. Seven patients had absolutely normal progress for first 4 weeks of DP but showed poor signs of progress later on. These cases could be managed by reducing the distraction rate to 0.75 mm/day till achievement of planned length. The results in our patient cohort are summarized in [Figure 4], and the healing parameters of each group are summarized in [Table 1]. Monitoring of distraction osteogenesis requires repeated radiological examination. An interesting study revealed that, for every centimeter of tibia lengthened, the patient is subjected to an average of six radiological examinations. The study also alerted higher radiation exposure in femoral lengthening as compared to tibial lengthening. Although radiation at these doses does not pose a risk of carcinogenicity or mutagenesis, we must take every effort to reduce radiation exposure to the patient as we go forward. In spite of the radiation exposure involved, radiographs are thought to be qualitative and inaccurate when it comes to assessing bone regeneration and remodeling while using circular external fixators. Radiographic assessment is also considered incomplete and inferior as vital information may be obscured by the radiopacity of the metal in the circular external fixator. Methods such as quantitative CT and DEXA are again limited by radiation exposure and cost. The study shows high efficacy of ultrasonographic dynamic structural evaluation of the regenerate bone during DP and early MP. Our attempt was to add sonography to every radiographic examination done as per our protocol to obtain correlating sonographical picture and see if some of the radiological examination could be replaced by sonography as an attempt to minimize exposure to ionizing radiation. Our results of sonographic assessment mirror those published earlier.,,,, We feel that the sonologist should develop personal experience of interpreting sonographic images in correlation with the radiographs along with their clinical relevance in decision-making, before replacing radiography with sonography in the follow-up assessment protocols. For reference, we provide serial sonograms (with corresponding line diagrams) of one of our patients (11-year-old male) with achondroplasia where tibia was lengthened by 7 cm [Figure 5]. Sonography in DP shows distraction site as a well-defined defect in native cortical bone. Distraction site is sonolucent and allows transmission of ultrasound waves through it; in contrast, adjacent cortical bone is nonpenetrable and reflects back all ultrasound waves, resulting in posterior acoustic shadowing below it. With time, there is a progressive increase in echogenic bone trabaculae at distraction site which are disorganized in early DP but are longitudinally aligned to the long axis of bone in late DP. In transverse plane, there is speckled appearance of echogenic foci in DP, which is likened to looking into the open end of a multifilament wire cut in cross section. In late DP and early MP, there is an increase in number, size, and calcium density of longitudinally oriented cortical bone and bone trabeculae which decrease both depth and a lateral dimension of echopositive area due to poor transmission and increased reflection of sound waves. In late MP, echopositive distraction site is absent, and sonological characteristics are similar to those with native cortical bone. Sonographical evaluation was valuable during the DP when regenerate bone appeared to be sonolucent with echogenic foci all throughout the DP. Sonography detected regenerate much earlier than radiographs. It also suggested the possibility of earlier detection of exaggerated or delayed response to distraction than with conventional radiographs. This is of great value for timely alteration in the distraction plan to get optimum results. Furthermore, DP is the time when frequent radiological monitoring is indicated and sonography is safer and more informative during this stage. Sonography is also informative in the first half of MP as the disappearance of echopositive portion of regenerate points to its maturation, where it gets replaced by hyperechoic cortical bone. However, sonography is limited in the second half of MP where the mechanical axis of the limb needs to be assessed, and decision has to be made regarding the optimum time of removal of fixators, based on the maturity of the regenerate. Radiography unquestionably is then the gold standard for these indications. We acknowledge several limitations of sonography in this regard. It is very much operator dependent with a steep learning curve. There are also technical difficulties in positioning and maneuvering the probe between the Ilizarov rings that may affect complete visualization. The need to temporarily remove certain components of the fixator for access without affecting the stability of the fixator may pose challenges in practical implementation. Measurement of distraction gap may be difficult if more lengthening is contemplated. Assessment of limb alignment is difficult due to the narrow field examined. We also felt that assessment of mineralization of regenerate is suboptimal with sonography to guide the fixator removal. Furthermore, sonography − unlike radiographs − is not subject to direct interpretation by the clinicians. They may not always be confident to make decisions on altering the extent on amount of distraction based on sonographical findings as with radiographic images. All sonographical examinations were done by single sonologist at one occasion and hence we could not address intra- and interobserver reliability and reproducibility as part of this study. The study has resulted in the following change in our practice. The quality of regenerate bone depends on several factors and distraction rate is one among the most important ones. This is guided mainly by radiographs taken once in 2 weeks during DP. In between these radiographs, the surgeon is intuitively guided to modify the distraction rate based on clinical findings such as pain, swelling, ROM of adjacent joints, ability to bear weight on the limb being lengthened, and patient tolerance. However, there are no objective parameters to guide this till the next radiograph. Hence, we explored the role of sonography as an additional modality to qualitatively and quantitatively assess the regenerate between standard radiographs as it does not involve exposure to radiation. As a result of gaining expertise in sonography at the end of this study, we currently monitor the regenerate with sonography during the DP and early part of MP at least once in 2 weeks and also when a patient develops any symptoms or signs stated above. We were also able to bring down the number of radiographic examinations to once in a month during DP (as opposed to once in 2 weeks previously). The purpose of radiography is mainly to assess limb alignment and look for any deformation of the regenerate and radiographs are repeated only if minor adjustments are made in the fixator to correct alignment. Sonography has become the most essential tool in our hands to monitor regeneration and decide distraction rate. Furthermore, sonography has become our investigation of choice for any problems during distraction to guide further action. Our recommendations to modify distraction rate based on sonographic findings are summarized in [Table 2]. 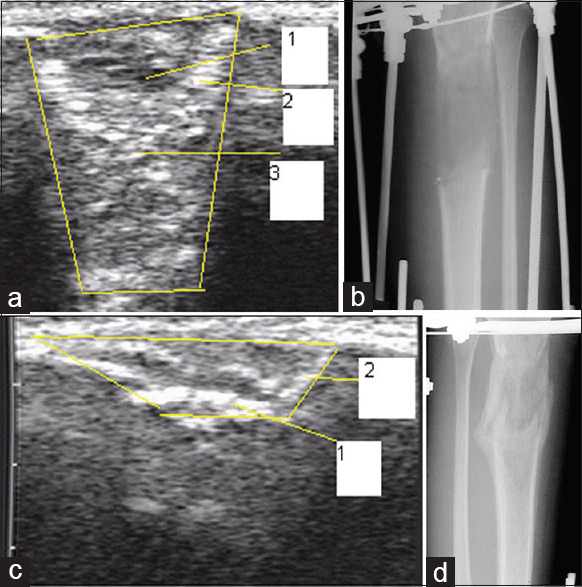 A judicious and combined application of sonography and radiography must be explored to provide superior characterization and monitoring distraction osteogenesis during limb lengthening, with lesser radiation exposure. However, this involves a thorough understanding of the biology of distraction osteogenesis and good expertise in interpretation of sonography. We thank Dr, Ragu C. Nathan, MD, Visiting Consultant in Radiology, SSSIHMS− Prasanthigram, India, Dr. Aparna Maddali, FRCR, Consultant Radiologist, Leighton Hospital, Mid Cheshire, UK, and Dr. Bharath B Das, MD, Fellow, in MSK Radiology, SSSIHMS − Prasanthigram, India, for their valuable suggestions for improving the manuscript. We also thank Irina A. Saranskih, MA, International Department, Russian Ilizarov Scientific Centre for “Restorative Traumatology and Orthopaedics,” for facilitating the study by translating relevant information between Russian and English. The authors certify that they have obtained all appropriate patient consent forms. In the form the patients have given their consent for their radiographical and sonographical images and other clinical information to be reported in the journal. The patients understand that their names and initials will not be published and due efforts will be made to conceal their identity, but anonymity cannot be guaranteed. Gubin AV, Borzunov DY, Malkova TA. The Ilizarov paradigm: Thirty years with the Ilizarov method, current concerns and future research. Int Orthop 2013;37:1533-9. Catagni MA, Lovisetti L, Guerreschi F, Combi A, Ottaviani G. Cosmetic bilateral leg lengthening: Experience of 54 cases. J Bone Joint Surg Br 2005; 87:1402−1405. Novikov KI, Subramanyam KN, Muradisinov SO, Novikova OS, Kolesnikova ES. Cosmetic lower limb lengthening by Ilizarov apparatus: What are the risks? Clin Orthop Relat Res 2014;472:3549-56. Stanitski CL. Limb lengthening for stature. J Pediatr Orthop 2004;24:593-4. Watts J. China's cosmetic surgery craze. Leg-lengthening operations to fight height predjudice can leave patients crippled. Lancet 2004;363:958. Poposka A, Atanasov N, Dzoleva-Tolevska R. Use of ultrasonography in evaluation of new bone formation in patients treated by the method of Ilizarov. Prilozi 2012;33:199-208. Young JW, Kovelman H, Resnik CS, Paley D. Radiologic assessment of bones after Ilizarov procedures. Radiology 1990;177:89-93. Swiatkowski J, Zarek S, Macias J. Diagnostic imaging in the planning and monitoring of limb lengthening by the Ilizarov method. Ortop Traumatol Rehabil 2002;4:273-81. Schiedel FM, Buller TC, Rödl R. Estimation of patient dose and associated radiogenic risks from limb lengthening. Clin Orthop Relat Res 2009;467:1023-7. Elbatrawy Y, Ragab IM. Safe cosmetic leg lengthening for short stature: Long-term outcomes. Orthopedics 2015;38:e552-60. Hussein A, Faflik J, Bik K. The importance of densitometric testing in the evaluation of regenerated bone during long bone lengthening by the Ilizarov method. Ortop Traumatol Rehabil 2002;4:282-9. Eyres KS, Bell MJ, Kanis JA. Methods of assessing new bone formation during limb lengthening. Ultrasonography, dual energy X-ray absorptiometry and radiography compared. J Bone Joint Surg Br 1993;75:358-64. Atanasov N, Poposka A, Samardziski M, Kamnar V. Analysis of radiographic bone parameters throughout the surgical lengthening and deformity correction of extremities. Pril (Makedon Akad Nauk Umet Odd Med Nauki) 2014;35:175-83. Blane CE, Herzenberg JE, DiPietro MA. Radiographic imaging for Ilizarov limb lengthening in children. Pediatr Radiol 1991;21:117-20. Hughes TH, Maffulli N, Fixsen JA. 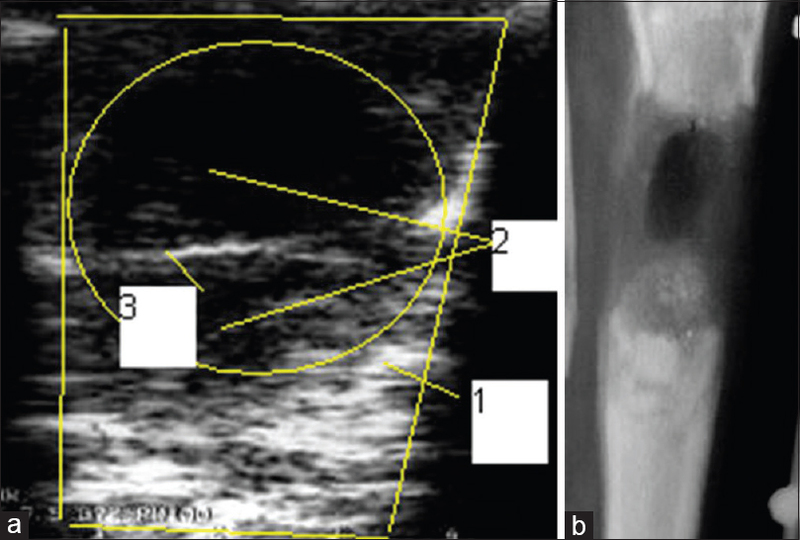 Ultrasonographic appearance of regenerate bone in limb lengthening. J R Soc Med 1993;86:18-20. Lundblad H, Maguire GQ Jr., Olivecrona H, Jonsson C, Jacobsson H, Noz ME, et al. Can na18F PET/CT be used to study bone remodeling in the tibia when patients are being treated with a Taylor spatial frame? ScientificWorldJournal 2014;2014:249326. Hatherly R, Brolin F, Oldner Š, Sundin A, Lundblad H, Maguire GQ Jr., et al. Technical requirements for Na18 F PET bone imaging of patients being treated using a Taylor spatial frame. J Nucl Med Technol 2014;42:33-6.